Let’s just get this out of the way: cauliflower steaks are not trying to be steaks. Cauliflower is not trying to catfish you—it’s not all, “Yeah, sorry, I don’t have a phone so we can’t talk, but I swear I’m a steak. Here’s a stock photo of me searing on a grill to prove it!” The term cauliflower steaks refers to the form the cauliflower takes, not the taste—rather than being broken into florets, it’s cut into thick slices. Because cauliflower steaks don’t taste or cook like meat, I’ve never used them as a meat substitute in a recipe—until now! When I happened upon a Parmesan Chicken Cutlets recipe from Epicurious, I went through my mental rolodex of chicken substitutes and came up empty. I have a weird aversion to combining tofu and cheese, so that was out. Chickpeas? Nope. Seitan? Meh. And then I thought that the breadcrumb coating might be delicious on cauliflower. I’d have to adjust the recipe to bake it instead of frying, but Crispy Parmesan Panko Cauliflower Steaks sounded pretty irresistible. When you cut cauliflower into steaks, you have to embrace the fact that they’re not going to be perfect—not like the photos you see in magazines, at least. When you cut the cauliflower into steaks, it’s inevitable that some florets will fall off, especially on the ends. That’s okay! As you can see in the photos here, we just bread and roast them with the rest. Other recipes I’ve seen say to discard the florets, reserve them for another use, or eat them as a snack, but unless you’re cooking for someone you need to impress, I say you should just cook them with the steaks. In my years of cauliflower steak making, I’ve learned a few tricks. 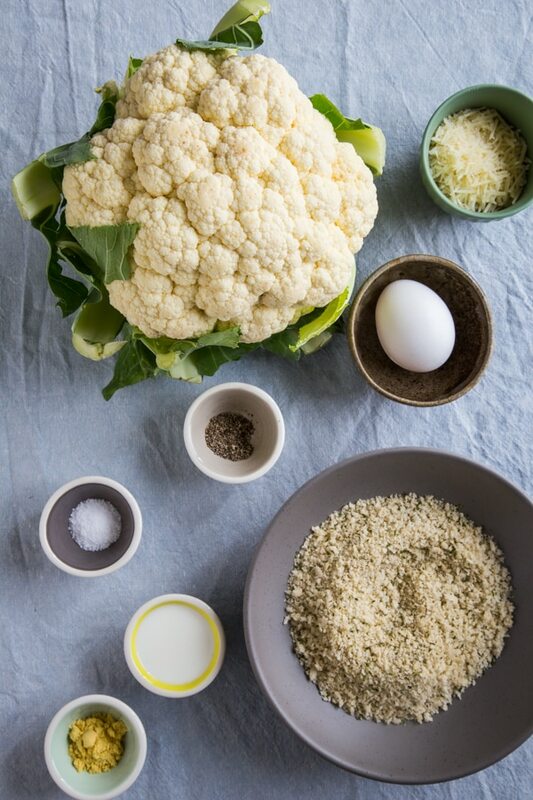 First, using a large cauliflower helps and if you can find one that’s oblong rather than round, that’s even better—it will allow you to cut more steaks that stay intact. I always start by cutting the cauliflower in half down the middle, from the top to the stem, and then I cut each half into steaks. You can serve these steaks with a variety of sauces, dressings and pestos—marinara or gremolata would be delicious—but I stuck with the original recipe’s suggestion of serving with lemon wedges. A squeeze of lemon juice and a sprinkling of fresh herbs is all these steaks need. Crispy panko-coated cauliflower topped with fresh herbs and a squeeze of fresh lemon juice. Inspired by Epicurious’ Parmesan Chicken Cutlets. Looks really good. Can I leave out the egg? My husband is vegan. Can you suggest me substitute. If your husband is vegan, this recipe probably won’t work for you – in addition to the egg, there’s parmesan in it too. My husband is not vegan but he just doesn’t eat eggs. I agree. I would never throw out smaller florets, what a waste. I posted cauliflower steaks last year and mine were a tad dry. I don’t know what I was missing. They were good but just OK. I should try yours, Kristen. Nope, not real steaks…but so darn good! I am a cauliflower fan at any time, but the crispy breadcrumbs make these even more tempting. LOVE the look of these! So amazing, so crispy!! I love cauliflower! And this idea is just perfect! Real Parmesan cheese isn’t actually veggie, so I was wondering what would be a good substitute cheese to use instead? Are you in Europe? In the US, there’s domestic parmesan cheese that’s made without animal rennet (I usually buy Whole Foods’ 365 brand, but Organic Valley is another option). If you’re in the EU, I believe there are parmesan substitutes that are usually labeled “hard cheese” or something like that–basically, you need a cheese with a low moisture content that can be grated. Jenni, you can likely find “vegetarian” parm or parm “style” cheese without rennet at your local crunchy supermarket! Good luck!! Unfortunately a lot of people (and restaurants alike) seem to think Parmesan is a safe cheese. Ugh! This looks so awesome!!! Going to try it tonight. Printed for future use. Thank you. What would you serve as a side? With (beef) steaks, I would serve mashed potatoes and a green veggie of sorts. You could do a salad or green, or even a white bean puree would be nice. Well, I made this with orange califlower (very Thanksgivingee). I substituted coconut flower. It came out great but with needs salt…lots of salt. I thought the cheese would do it but NAH…I also used 1 c panko and 1c cheese. I think I will use less panko next time. I can’t wait to go to the farmers market to see if I can get another orange cali. for my cousins for Thanksgiving. It’s a hard one this year. I lost my cousin’s Mom and Dad this year. My Aunt and Uncle were the last of the Mohegans. Now only 1 sister, niece and nephews, plus my Uncle Mikes boys and of course the host of cousins one never sees. I will try to make it especially festive FOR THEM n for me, I’m very sad too. Looking at the man in the moon tonight, well….I called all of them and said, “go outside” see the man in the moon….do you recognize that face? Anyway…recipies good. Have your oil spray ready and SALT….. This is the first comment I’ve ever left on a recipe because this was sooooooo good. I preferred the florets to the steak personally, but both were great. Def don’t leave out the lemon! Thanks for the great new recipe!! I made this last night and even my husband and son loved it…cauliflower and all! I changed from regular flour to corn flower and used seasoned gluten-free panko crumbs. I also forgot to put the flour on a seperate plate and mixed it in with the other dry ingredients. I don’t think it hurt the recipe and saved a step. Awesome recipe — thanks oh my veggies. I made these today and found them a little dry. The flavor was good, but next time I will try something to give it a bit more moisture. As a side note, i dropped the cauliflower crumbles into the flour and egg and panko just to try to use everything up and they were terrific!